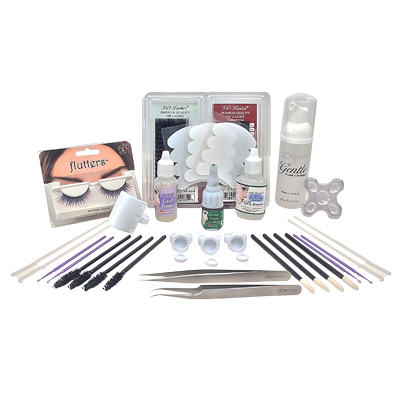 Perfect beginner kit with all the essential eyelash extension tools and products. Approximately 40 procedures. Kit includes: Volume Adhesive - 5 mL, Adhesive Gel Remover - 15 mL, Lash Toner - 15 mL, Gentle Foam Cleanser - 1.7 oz., Practice Strip Lash, VIP .15 J Curl, Mixed Length 9mm -14mm, VIP .15 C Curl, Mixed Length 9mm -14mm, Curved Tweezer, Fine Point Tweezer, Biogel Eye Pads - 48 pairs, Disposable White Combs - 25/bg., Lint Free Applicator Sticks - 50/bg., Micro Applicator Brushes - 100/bx., Disposable Adhesive Trays - 50 pk., Mascara Wands - 25 pk., U-Band, Smart Rings - 25 pk., O-Disks - 25 pk.